Osun State Polytechnic, Iree (OSPOLY), Higher National Diploma (HND) First and Second Batch Admission List for 2018/2019 Academic Session Out. This is to inform all candidates who participated in the Osun State Polytechnic, Iree (OSPOLY), Higher National Diploma (HND) admission screening exercise that the admission list for 2018/2019 academic session has been released. 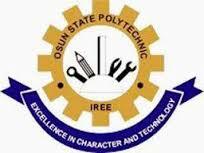 Osun State Polytechnic Iree First and Second Batch HND Admission list has been uploaded online. Kindly log on to OSPOLY Iree portal via http://applications.ospolyiree.com/student/Default.aspx. Enter your Application Number and Password in the required columns.